Well, not really. My son found an old sketchbook I was using a decade ago. 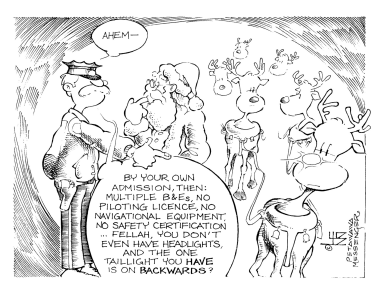 Within were some cartoons the Petawawa Messenger published in ’96 . . . cartoons I hadn’t shown on my earlier website. Subsequently, they’re reprinted here with a brief explanation. Really brief, if I can’t remember the stories behind ’em. An announced peace plan in ’96 took a serious blow when the IRA bombed London in February of that year. 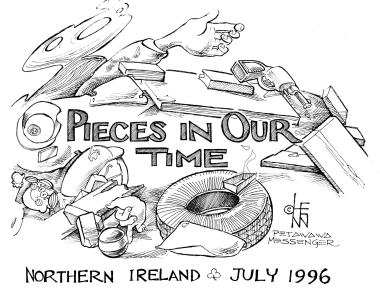 Subsequent bombings in Manchester in June and Enniskillen (Northern Ireland) in July depressed even the overly-enthused. 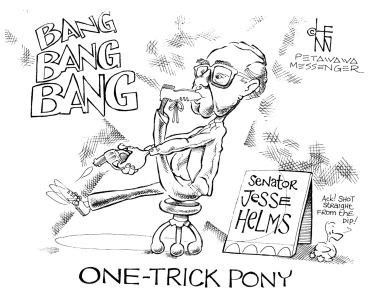 I couldn’t possibly explain this cartoon better than by sending you to Betty Bower’s page, wherein Mr Helms’ pronouncements are enshrined for posterity. 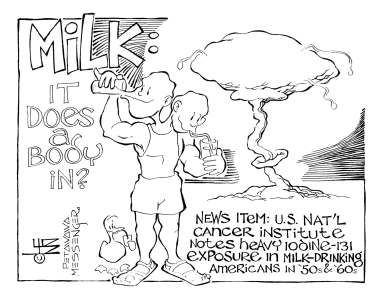 It turns out the milk in the ’50s and ’60s was a great way to introduce radioactive iodine-131 into growing children. Such was the nuclear age. 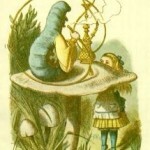 These days, of course, it can contain steroids, hormones, antibiotics, herbicides and insecticides — and possibly prions. None of these, however, make your bones glow. Rudolph’s nose, here, is the kicker. One day, I intend to colour these.